Handmade Necklaces first appeared on Chictopia's streetstyle gallery in Winter 2009 seen on Washington blogger districtofchic of districtofchic.com. She styled her blue handmade turquoise silver necklace with a brown Ray Ban turtoise shell sunglasses, green American Apparel tank top top, and blue Seven For All Mankind high waisted jeans. Since then, Handmade Necklaces have grown in popularity as bloggers from Small Town, Los Angeles, and Jakarta have discovered them. 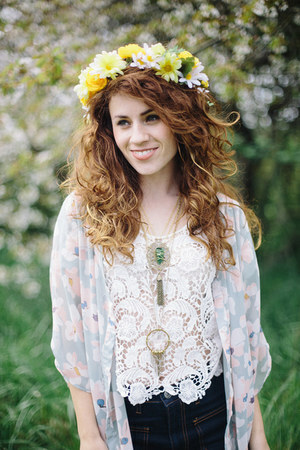 Handmade Necklaces are generally seen in casual, chic, and bohemian style. Popular types of Handmade Necklaces are flower, chain, beaded, necklace, and cameo. Blogger's favorite colors are silver, gold, black, and turquoise blue. There are currently 579 streetstyle photos of bloggers wearing Handmade Necklaces. Most recently, blogger AnnikaVictoria of pineneedlecollective.com wore her gold handmade necklace with a brown NAOT "kedma" shoes, eggshell Liz Lisa dress, and periwinkle id:c cardigan. I bought this necklace day after I saw the picture posted on a handmade artist. Simply I could not resist because it looks so awesome! and, do not forget how much I like cherries. What do you think? How can I wear it so that it is a piece of resistance?